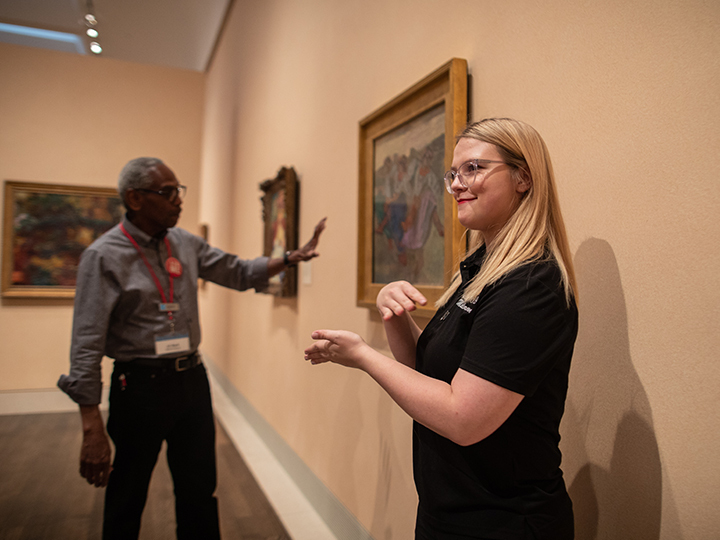 Mallorie Howe, senior in the American Sign Language Interpreting program at UH, is one of ten students who will lead a public tour for deaf patrons at the Museum of Fine Arts, Houston on Saturday, March 30. Yvonne Butler knows the emotional and educational hardships members of the deaf community can face. “I struggled in public high school because I wasn’t able to lip read well enough or teachers forgot that I needed to see their lips to understand them,” said Butler, who is deaf and now works as the lab supervisor and tutor for students in the American Sign Language Interpreting (ASLI) program at the University of Houston. UH is the only university in the state that offers a bachelor’s degree in ASLI. Butler will be among members of the deaf community at Museum of Fine Arts, Houston (MFAH) on Saturday, March 30 for a first-of-its-kind docent-led tour interpreted by senior-level students in the UH ALSI program. The tour coincides with the Vincent van Gogh exhibit currently on view at the MFAH. Two docents and two students will be stationed at five “highlight” pieces from the impressionist era. ASLI students have been researching specific facts about the artwork and developing talking points with docents to prepare for the challenge. ASLI Program Director Sharon Hill hopes this event will be the first step in what could eventually be dedicated tours at MFAH that cater to the deaf community. After the tour is over, guests will provide feedback of the students’ work, which will be graded. Junior-level students will greet visitors and man an informational booth on deaf awareness. The entire booth experience will be conducted in ASL. Butler remembers a time when there were no professional sign language interpreters and ASL was not even recognized as a language. ASL is not a gesture-based translation of English. It is a distinct language that requires interpreting of its complex grammar, pronunciation and word order rules. With a growing number of industries such as manufacturing and medical using sign language interpreters these days, Butler believes we’ve come a long way. According to the United States Bureau of Labor Statistics, the demand for sign language interpreters is expected to rise 46 percent by 2022, which translates to an increase of nearly 30,000 jobs. The ASLI program at UH draws students from around the state and the country. Courses are taught by deaf professors so that students experience both a cultural and linguistic immersion in the classroom.